Microsoft has launched a capped beta of its free security programme Microsoft Security Essentials, but the UK will not be given the opportunity to check it out. The 75,000 beta has just launched for the programme – which will represent Microsoft's foray into free internet security software, but the test software is limited by geography as well as numbers. 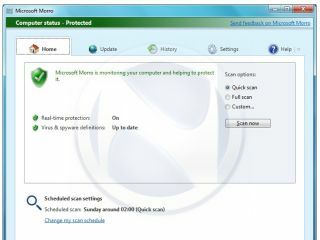 Microsoft Security Essentials (MSE), formerly codenamed Morro, is a free anti-malware solution that will provide people with basic protection from the internet's most troublesome nasties. "Not available in your country or region. "You appear to be in a country or region where the Microsoft Security Essentials Beta is unavailable. "This beta is available only to customers in the United States, Israel (English only), People's Republic of China (Simplified Chinese only) and Brazil (Brazilian Portuguese only)." TechRadar has contacted Microsoft for a comment and is awaiting a response. UPDATE: It appears that by logging into Microsoft Connect, rather than going to the Microsoft Security Essentials site, users in the UK can download the software. UPDATE 2: Microsoft tells us: "We selected a small number of markets to beta-test the product in order to keep feedback and support issues to a level that met our capacity goals for the beta. "Markets were selected based on a number of factors including anticipated user numbers, numbers of unprotected PCs and the range of user scenarios. "We look forward to delivering the final version of Microsoft Security Essentials in the UK in the second half of 2009"